The Zeiss Axiophot Photomicroscope provides a flexible light microscope for both transmitted and reflected brightfield microscopy. This upright microscope can be used not only for brightfield but is also capable of phase contrast, transmitted and reflected polarization, Nomarski differential interference contrast (DIC) microscopy, darkfield and general fluorescence imaging, depending on the insert used. This trinocular head microscope can easily be out fitted with a camera for microscopy photography, while the broad stable stand base keeps vibrations to a minimum. The stand base of this light microscope has coaxil coarse and fine adjustments control, letting users adjust the stage travel over 25 mm. The stage and condenser for this upright microscope travel together. The Axiophot comes with 10x Binocular Eye Pieces, 5x Plan NEOFLUAR Objective, 40x Plan NEOFLUAR Objective, 100x Plan NEOFLUAR Objective, as well as Filter Slide Assembly with Slides. The Zeiss Axiophot Photomicroscope features a slot system that allows users to change their methods, with slots for analyzers, Bertrand lens slide, Optovar slide and reflector slide, auxiliary objects, reflected light polarizers and a reflected light system FI. Filters can be toggeled between using the filter magazine at the base, below the coarse adjustment focus control. 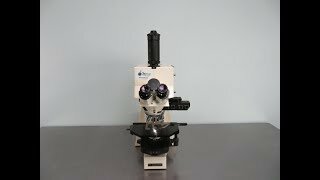 This Zeiss Axiophot Microscope has been fully inspected and the optics are clear. All of our lab equipment comes backed with our standard warranty. Should you have any questions, please don't hesitate to contact us.